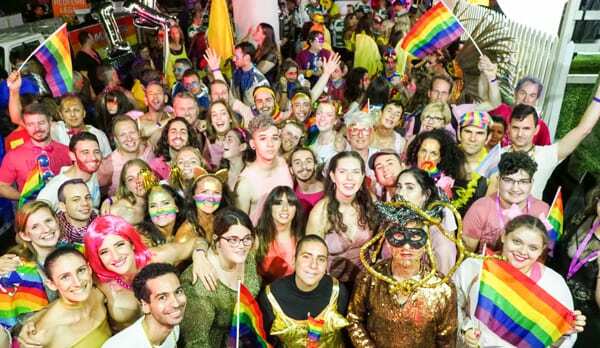 Over 60 people danced up Sydney’s Oxford St. with a rainbow flag to choreography created by Kathy Baykitch and music which ranged from the Pesach song, “Dayenu” through Frank Sinatra’s “Love and Marriage” to gay anthem, “ Free, Gay & Happy”. The intermittent drizzle did nothing to diminish the electric energy of the night. “It was wonderful to feel the welcoming vibe throughout the parade”, said Kim Gotlieb, Secretary of Dayenu and organiser of this year’s float. 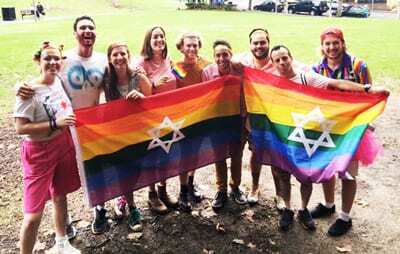 He also added that it remains important to maintain a Jewish presence in the GLBTI community, as well as keeping the conversation alive in the various streams of Judaism. Kim was featured on the float wearing a dazzling gold sequinned outfit, which was previewed at the Mardi Gras Shabbat service and dinner at Emanuel synagogue in Woollahra. Tiernan Brady, Executive Director of Australians for Equality was one of the speakers at the dinner, together with Justin Koonin, President of the Aids Council of NSW ( ACON) and a member of Emanuel Synagogue. Justin’s speech included reflections on the impact of a visit to Auschwitz. Tiernan, an Irish Catholic spoke of the importance of ongoing dialogue which encourage movement through acceptance, rather than criticising opposing views. 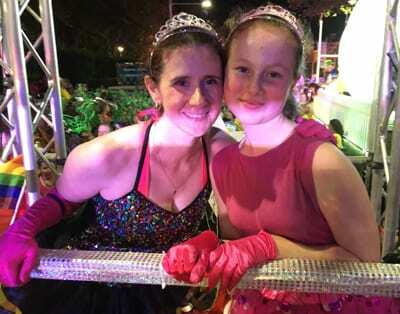 On the float was twelve year-old supporter Mia Richter-Weinstein who said, “It was really great, and everybody rocked it”. Mardi Gras is a time where politics in pushed aside and everyone just want to party and have fun. Dayenu, Sydney’s GLBTI Group added their own special flair to this year’s parade. Regarding Rabbi Ingram’s comments, I advise him that people in glass houses should not throw stones. The results of the recent Royal Inquiry into child abuse have shown us who is more likely to be abusing children. Totally with you on that one Roy. It is a sign of ignorance and ill education when people call child participation in the Mardi Gras parade child sexual abuse. Similarly calling homosexual and transgender people “abnormal” demonstrates a limited and lacking understanding of human sexuality in these individuals. There is a litany of proven child sexual abuse from within the Orthodox and Ultra-Orthodox Jewish community in Sydney, Melbourne, Israel, New York and London, just for starters. By making scurrilous and spurious claims of child sexual abuse here minimises the harm inflicted on the genuine victims and survivors of child sexual abuse. There is zero evidence that child participation in Mardi Gras and other LGBTIQ parades is the slightest bit damaging or even remotely close to child sexual abuse. Quite the contrary, they celebrate the wonderful diversity of human sexuality and gender identity. They also help reduce the rates of suicide, self-harm and mental health issue that are frequently exacerbated by the very intolerance that these accusations of child sexual abuse feed. So now children as young as twelve are being encouraged to take leading roles in this shameless display of debauched decadence. This too is a form of child sexual abuse. Yet everyone is silent! That’s pot calling kettle black. I would like to hear the Rabbi’s opinion about the real child abusers within his community and more importantly, the deafening silence by many Rabbi’s on this matter. Might I remind the Rabbi that the Mardi Gras Parade is a celebration of diversity, acceptance, love and equality – something which he and other ‘spiritual leaders’ can learn from.